Often served with onion, carrots and snap peas, the dish is very nutritious. The ingredients of nikujaga can be easily found in many countries. So why don’t you try it? 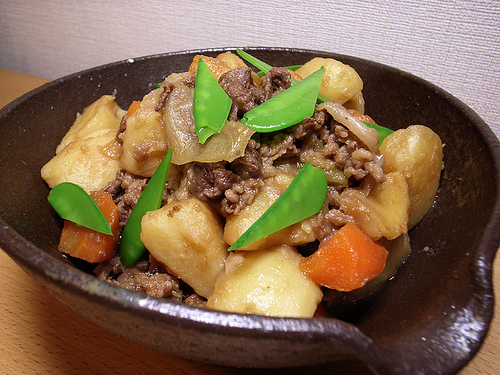 Nikujaga was invented by chefs of Japanese Navy in the late 19th century. They came up the recipe when they were trying to make beef stew. That is why the ingredients (besides the seasoning) are similar. In Japan, it has been loved as mom’s homemade dish, and many men name nikujaga as the dish they want their girlfriends or wives to cook. Wasabi Stories vol.5: “Whatever” Leads To Your Ruin ! ?